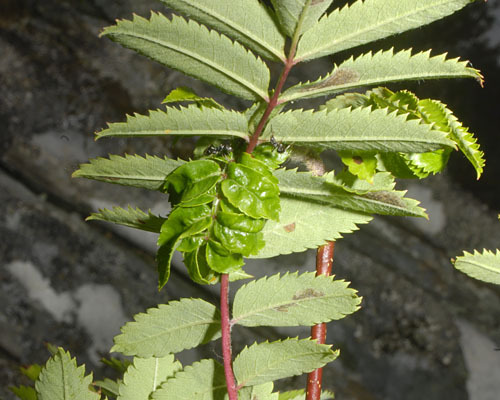 Colonies of Dysaphis sorbi live in large leaf nests on Sorbus aucupariae (rowan) (see first picture below). The mature leaf nest is characterized by the leaf lamina senescing and turning brown, but the mid rib remaining green. 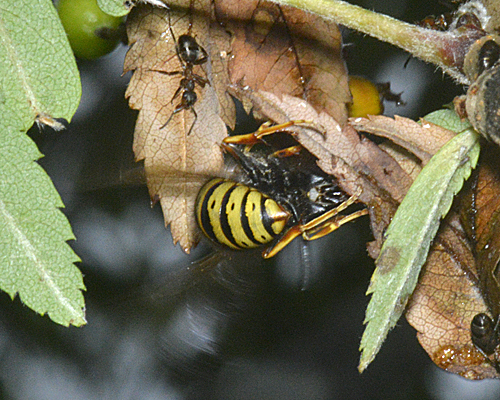 The adult apterae are reddish-brown to dark green (see second picture below). The antennae are somewhat shorter than the body. 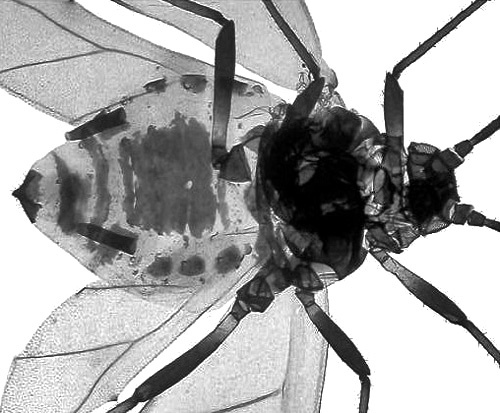 A distinctive feature of the apterae is that they have small but prominent marginal tubercles on abdominal tergites I to VII, just visible on the micrograph of an aptera in alcohol (see below). 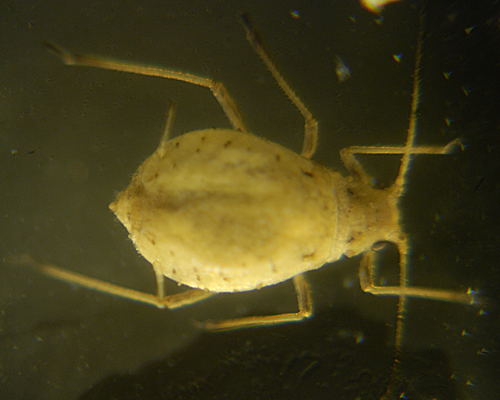 The pale yellowish siphunculi are cylindrical and slender and are 2.4-3.2 times the length of the cauda. The cauda has 140 hairs. 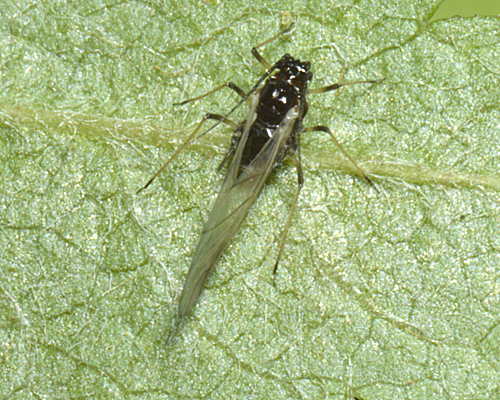 The body length of an adult aptera is 1.8-2.8 mm. 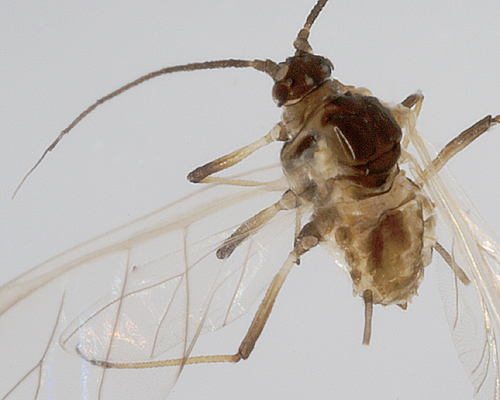 Winged females developing on the primary host have dark antennae and dark slender cylindrical siphunculi, plus an ochreous to reddish yellow abdomen with a dark trapeziform dorsal patch. The micrographs below show an adult aptera and an alate Dysaphis sorbi in alcohol. The clarified slide mounts below are of adult viviparous female Dysaphis sorbi (on secondary host) : wingless, and winged. Dysaphis sorbi is facultatively host alternating, with rowan (Sorbus aucuparia) as its primary host and bellflowers (Campanula) as its secondary host. Winged females are not produced till June and colonies may be found on rowan all year. 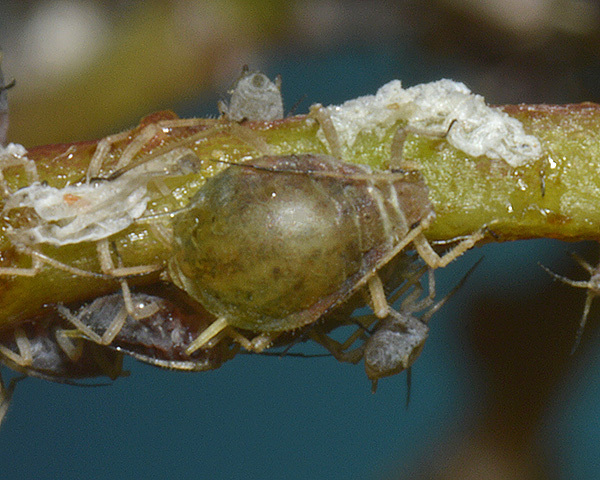 On the primary host aphids may be found either in leaf galls or on the stems bearing developing berries. 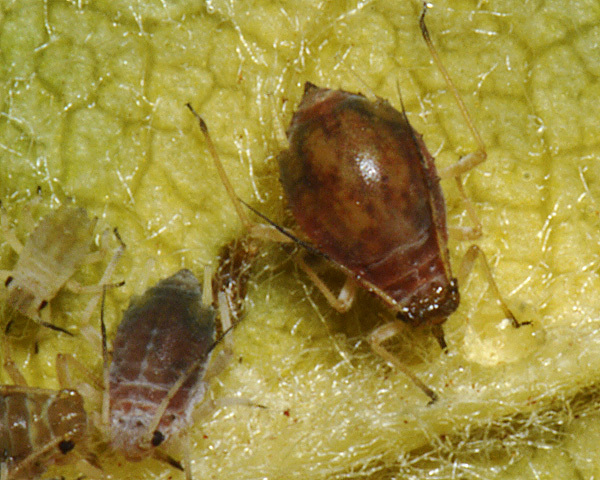 Early colonies (see picture below) of Dysaphis sorbi crumple the leaves. The characteristic coloration of the Dysaphis sorbi leaf nest - the leaf lamina senescing and turning brown, but the mid rib remaining green - only develops in the mature leaf nest (see picture below). Dysaphis sorbi has been the subject of a number of behavioural studies in relation to the coevolutionary hypothesis on warning signals in plants. This states that red and yellow leaf colours in autumn signal to herbivores like aphids that the trees are well defended, and therefore should attract fewer colonizing aphids. Schaefer & Rolshausen (2007) artificially coloured leaves of rowan (Sorbus aucuparia) and monitored numbers of aphids landing on the leaves. 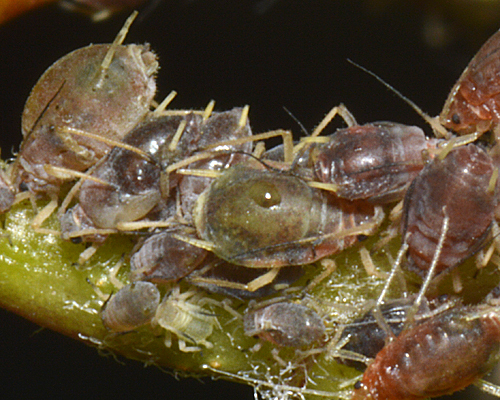 These aphids included both Dysaphis sorbi and Rhopalosiphum oxyacanthae, the species recorded at Dundreggan. They found that contrary to the hypothesis there was no difference in the number of aphids landing on the different coloured leaves. They did, however, find that there was a strong positive correlation between aphid numbers settling and fruit production of rowan. This latter observation may relate to our observation that some of the aphids at Dundreggan in July had left the leaf galls and were feeding at the base of the developing berries (see pictures above). 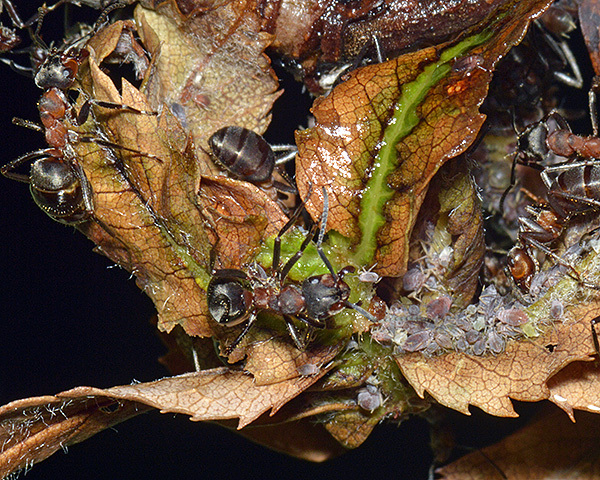 Rearing these aphids produced only alates which presumably would then have migrated to the secondary host (Campanula). 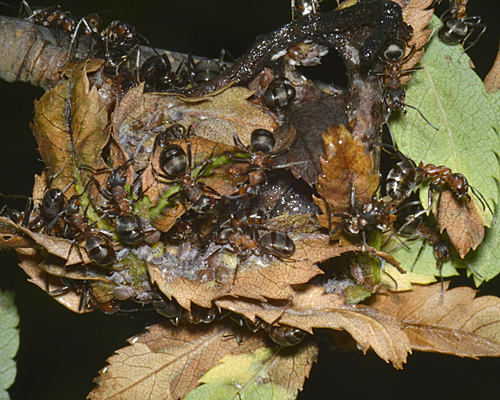 Rearing the aphids from the leaf nests produced only apterae. 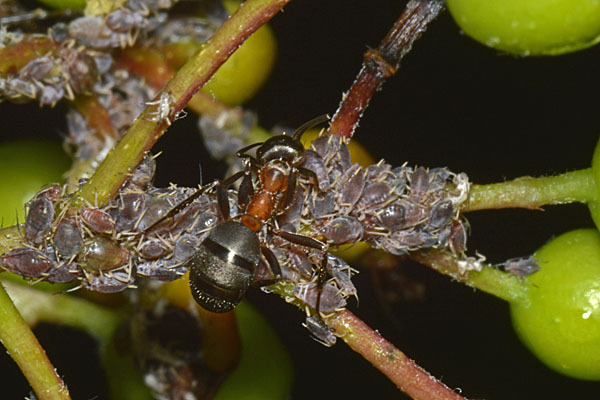 One surprising aspect about Dysaphis sorbi highlighted by Heie, 2009 is that unlike most host alternating aphids, the males are only produced on the secondary host. The alate females which bear the apterous oviparae with which the males mate develop on both primary and secondary hosts. This means that host alternation is necessary for fertilization of overwintering eggs. Colonies produce abundant honeydew which often attract a feeding frenzy of insects coming to consume it. In Dundreggan, Scotland we found numerous ants (Formica lugubris), adult hover flies (including Melanostoma scalare) and wasps (Vespula spp.). 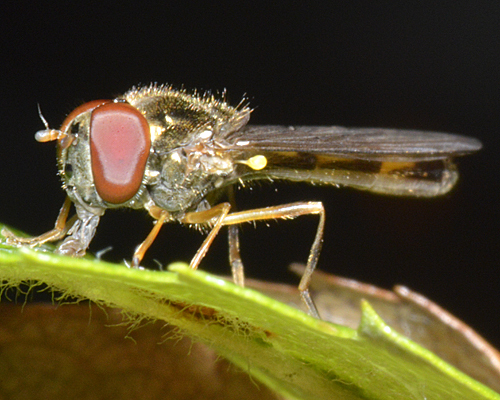 However, there were rather few predators around (a single syrphid larva) and no evidence of parasitoid activity. 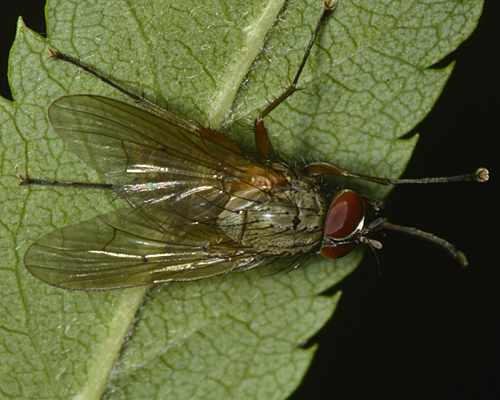 Dysaphis sorbi has been recorded from 7 Sorbus species. Blackman & Eastop list 13 species of aphid as feeding on rowan (European Mountain Ash, Sorbus aucuparia) worldwide, and provide formal identification keys. Of those aphid species, Baker (2015) lists 10 as occurring in Britain: Aphis pomi, Aphis spiraecola, Brachycaudus helichrysi, Dysaphis sorbi, Eriosoma sorbiradicis, Macrosiphum euphorbiae, Muscaphis escherichi, Myzus ornatus, Ovatus insitus and Rhopalosiphum oxyacanthae. Dysaphis sorbi has been recorded from 4 Campanula species (Campanula patula, Campanula persicifolia, Campanula rotundifolia, Campanula scheuchzeri). Blackman & Eastop list 7 species of aphid as feeding on harebell (Campanula rotundifolia) worldwide, and provide formal identification keys. 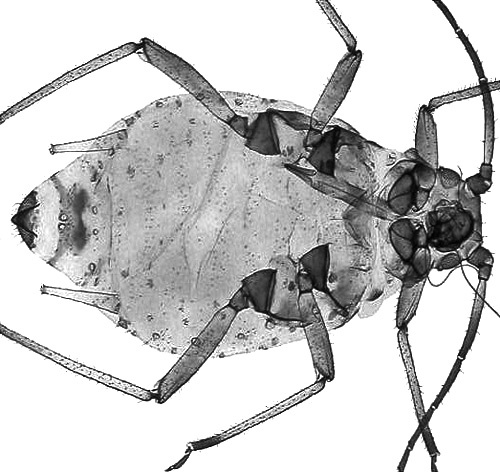 Of those aphid species, Baker (2015) lists 5 as occurring in Britain: Dysaphis brevirostris, Dysaphis sorbi, Myzus ascalonicus, Rhopalosiphoninus staphyleae and Uroleucon campanulae. We especially thank Trees for Life for their kind assistance, and permission to sample.